Origin and distribution: The cattle from which Bahima cattle originated were brought to western and southern Uganda by Hamitic tribes migrating from northeastern Africa and possibly the Sahel in the 13th and 15th centuries. 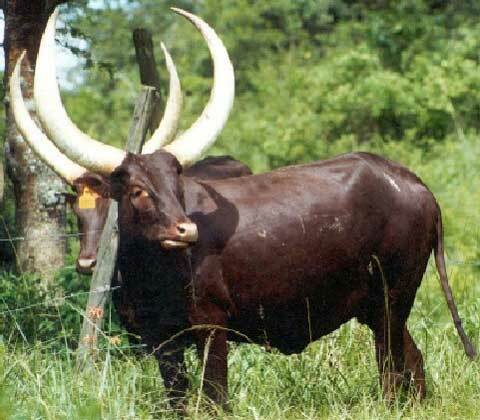 The Bahima cattle are a strain of the Ankole group of cattle (Epstein 1957). One theory states that the original Ankole cattle evolved around Ethiopian highlands (epicentre of Sanga dispersal) and the Bahima tribes brought them to northern Uganda (Rege and Tawah 1999). Another theory argues that the Ankole cattle with their characteristic long horns probably evolved around present-day Uganda, and developed further into the local strains of this Sanga group (The Bahima cattle) (Felius 1995). The Bahima cattle are maintained by the tribe of the same name in two areas that are separated by tsetse-infested territory. One of these is located in northeastern Zaire and across the border in northwestern Uganda. The second group is in southern Uganda and northern Tanzania. Physical characteristics: Adult male on average weigh 500 kg, while an adult female and live weight ranges between 300 and 400 kg. Average height at withers of Bahima cattle is 145 cm in males and 118 in females (Mason and Maule 1960). Coat colour is mainly dark red. However, black, brown, white, grey and dun are also found. Horns are normally very long and large, curving gracefully outwards and upwards, and finally inwards, but there is a great deal of variation, from long, lateral horns (sometimes 185-190 cm) to shorter and thick horns. A small cervico-thoracic hump is found only in males and females are usually humpless. Dewlap is moderately developed. Peculiarity: Bahima cattle have a typical sanga phenotype, with long horns, large to medium body size; tall at withers; small and cervico-thoracic hump; and moderately developed dewlap (See pictures). They are the tallest of the Ankole group of cattle, and the most susceptible of the Ankole group to rinderpest and trypanosomosis. Until the conflicts of the Lakes region in recent decades, the Bahima had been free of zebu influence seen in the Sanga of Ethiopia and the Sudan (Rege and Tawah 1999). Breed status: In Democratic Republic of Congo (DR Congo) they are raised by Hema people (DAD-IS, 2005). There is no population estimate. In DR Congo and Uganda the breed is categorised as vulnerable due to conflict and crossbreeding/interbreeding (DAGRIS, 2005). Utility: Their main uses are milk, meat and work. Total milk yield was estimated to be 302 litres in average lactation length of 212 days. Average milk butterfat content was 4.5% (Mason and Maule 1960). Epstein H. 1971. The origin of the domestic animals of Africa Volume I. Africana Publishing Corporation. New York. London. Munich. Felius, M., 1995. Cattle breeds: an encyclopaedia. Misset. Doetinchem (The Netherlands). 799 pp. Mason I.L. and Maule J.P. 1960. The indigenous livestock of eastern and Southern Africa. Common wealth Agricultural Bureaux. Farnham Royal, Bucks, England. pp. 25-29. Rege J.E.O. and Tawah C.L. 1999. The state of African cattle genetic resources II. Geographical distributions, characteristics and uses of present-day breeds and strains. FAO/UNEP Animal Genetic Resources Information Bulletin 26:1-26. Mbuza F.B. 1995. The indigenous domestic animal genetic resources in Uganda. FAO/UNEP Animal Genetic Resources Information Bulletin 15:27-50. Payne W.J.A. 1970. Cattle production in the Tropics. Volume 1, General introduction and breeds and breeding. Longman Group Ltd: London (UK). 336 pp.